ALL.BIZ Canada Canada products Home and garden Home textile Carpet products Carpets Rectangular Rugs and Carpets. Tabriz ht rug 4'7'' x 6'7''. Rectangular Rugs and Carpets. 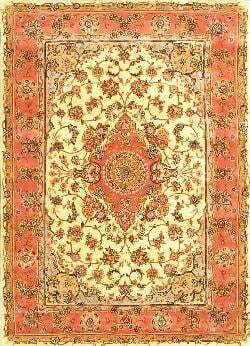 Tabriz ht rug 4'7'' x 6'7''. Tabriz is one of the most important rug weaving centers of Iran. Tabriz rugs have the most diverse designs - medallion and corners with endless repeats of curvilinear rosettes, panelled garden, pictorial, all-over and geometric designs. Dark reds and powerful blues predominate with ivory used as a contrast. These rugs with their classical and innovative designs and colors are expertly handtufted in China using 100 pure wool.